The Sussex Sign Company is a full service Sign Manufacturing and vehicle wrapping organisation based in the South East of England but working nationwide. 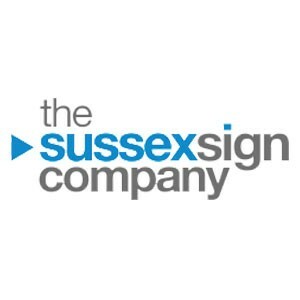 Proudly fulfilling our clients’ signage needs for over 20 years, the Sussex Sign Company provides a truly comprehensive array of signage and branding solutions to a varied range of small and medium enterprises (SMEs). As an SME ourselves, we have the ability to respond with ease to the needs of our similarly sized customers with that individually-tailored, warm and personable approach that we know you’ve rightly come to expect. Our approach to our clients, whether new or returning after many years’ of successful partnership, is based upon trust and a recognition that every business is unique. Our range of sign making and related services is all-encompassing. From our in-house graphics sign design teams and branding specialists, to our professionally accredited sign installation crews, we are totally equipped to create a holistic signage solution perfectly suited to your company. Signage is far more than a piece of writing above a shop doorway. The failure of many businesses, particularly smaller ones, to recognise and act upon this means that they risk missing out on one of the most economical and effective forms of promotion available. We understand the full potential of signage to transform ‘just another business’ into a bright, memorable and stand-out member of the local community, with every one of your signs carrying a meaningful message that resonates with everyone who views it. The key is to build your brand with a consistent and positive message, and our sign design service, combined with our decades of expertise can make this a reality for your business. We fully believe that expertise is crucial in sign making. A professionally designed and well maintained sign can engender feelings of trust and familiarity, encouraging passers-by to become repeat customers. On the other hand, shoddy, poorly installed and illegible signs not only fail to draw in new customers, but actively discourage them from entering your premises. Our team’s decades of finely honed expertise in every aspect of signage means that we can help you to avoid common pitfalls and errors, and ensure that your investment in signage pays dividends. Nowhere is the need for this more keenly felt than in the retail sector. Our comprehensive retail signage solutions ensure that you’ll stand out from the crowd like never before, and become the talk of the high street overnight. No matter what your specific area of retail, we can even provide industry-specific signage, such as estate agent signs or vinyl window overlays. The power of signage needn’t stop at the shop exit. Our vehicle wrapping services ensure that your brand is visible wherever you are, 24 hours a day and 365 days a year. Combined with our highly skilled branding specialists and graphic design team, vehicle wrapping can be a powerful community relations builder. Whether you have a single treasured van or a vast fleet, by wrapping your vehicles in vinyl displaying distinctive high-definition printed graphics alongside your trading name, you create brand recognition simply by driving around as usual. Over time, thanks to your memorable van design, your business brand starts to be seen as a part of the community, leading to a stronger reputation and high levels of consumer trust. And it’s highly economical as well. Measured by the cost per impression, vehicle wraps are one of the most cost-effective promotional channels available. Signs offer a promotional tool of almost unparalleled effectiveness, but we believe that that’s not all they can do. We understand how wayfinding signage, designed to help visitors and customers find their way around large and unfamiliar buildings, can be utilised to improve the customer experience. Again, well-planned design and installation of wayfinding signs is paramount. Poor design can actively diminish the customer experience, and we possess the know-how to ensure that this does not happen. We know signage, to put it simply, and we know that there is more to a job than simply screwing a sign to a wall or fixing it in the ground. Signage design, manufacture and installation represent only a part of the service that we offer our clients. Signage is an investment, and to ensure that that investment continues to provide the highest return possible, regular maintenance is necessary. To this end, we are delighted to offer bespoke maintenance plans tailored to the specific needs and circumstances of your business, guaranteeing that your signs continue to turn heads and start conversations for many years to come. To find out more about the huge variety of services and signage solutions that we have to offer, please get in touch today.